There’s a game I like to play called the appreciation game. This is a practice created by the great teacher Abraham-Hicks. It’s an awesome game because it’s a lot of fun and everyone wins. Here’s how it works: You just appreciate, and appreciate more, and appreciate more. You appreciate everything in your life that’s good right now, even the smallest stuff. It’s not only really fun, but it also amplifies your attracting power! Let’s say you have a job you don’t like. Every day you wake up and sit on the edge of your bed and stare at the wall and think about your commute and the long meetings. Then you walk into work and you’re thinking, “Let’s just get through this.” You’re bored and complaining to your friends or your partner. You’re counting down to the weekend. And by Sunday night you’re staring at the wall again. All you want is a new job, but every time you look there aren’t any good listings. No one responds to your applications. The few jobs that look interesting don’t pay enough. This kind of situation can make you feel very frustrated and stuck. But the truth is that all you have to do is make ONE mindset shift in order to get on the path to the job you love. That shift is to begin appreciating what you do have right now, in THIS job. When you appreciate the job that you have now, no matter what it is, it actually helps you attract that exact career path you want! This is a big misconception. The truth is that the more you appreciate what’s in front of you, the more you attract what it is that you desire! Check out this clip of a talk I gave on this topic at the Play/Ground event in June 2018, which was put on by POPSUGAR. Then keep reading for a breakdown of the power of appreciation and how to play the appreciation game! If you begin to appreciate that job that’s not that great, you start to emit a higher-frequency energy. You show up to work with a better attitude. You speak up more in meetings. You find ways to make your work more interesting and purposeful. Your boss and coworkers pick up on that energetic shift. They start to see you a bit differently. Maybe they see that potential in you and give you a cool new project or a raise. One day you realize you’re just in a really good mood because you’ve been appreciating everybody, your resentment has lifted and you’re no longer complaining. The next thing you know, you’ve set up a call with this person for the next day. This is not some wild coincidence. This is the kind of encounter you can expect to attract when you are in an energy of appreciation. Your appreciation creates these opportunities. Whereas when you’re in an energy of lack, fear or negativity, you’re likely to deflect the creative possibilities in your life. Your energy literally repels them. The Universe responds to energy. I cannot stress this enough. When you are in an energy of appreciation, you attract the exact people, circumstances and opportunities you desire. Gabby, how the hell do I appreciate something I don’t like?! Let me give you some examples. Because like I said, this game is EASY. All I ask is that you be willing to try it out. I appreciate that I have a job in the field I want to be in. I appreciate that I can pay my bills and put money into savings. I appreciate my coworker for always helping me out when things get crazy. I appreciate that really nice client. So far I’ve been talking about a work-related example, but you can play the appreciation game with anything in your life. I appreciate the freedom of being single and the excitement of meeting new people. I appreciate the opportunity to meet so many different people. Even if it’s not true love, it’s really cool to connect. I appreciate dating because I get to check out great restaurants and try new activities! If you’re really stuck in negativity, you can keep it even simpler. Gently notice something around you that brings you just a bit of joy. Maybe it’s the snack you’re eating or the sound of rain falling. Just appreciate. Whatever you appreciate you create more of. When you’re in a state of appreciation you’re in vibrational alignment with your true love nature. In a state of appreciation you’re relaxed, surrendered and faithful. That is the perfect energy for allowing your desires to come into form. When you’re aligned with appreciation you can surrender your desires to the Universe and trust in a plan beyond your own. When you assume an energy of appreciation, you feel good in the present moment regardless of whether your desires have manifested yet. In a state of appreciation you’re having fun along the way. The more fun you have, the more you will become a magnet for what you desire. So today, become willing to appreciate. Even if you’re still a bit skeptical, give it a try. Start to make it a habit to pivot into appreciation in those moments when you drop into negativity. As soon as you notice it, stop the thought and gently shift. What can you appreciate right now? You can also try a beautiful morning practice created by Abraham-Hicks. Each morning, open your journal and write three to five pages of everything you appreciate. These things can be on any topic. They can be small, big, serious and even silly. If you can’t fill that many pages at first, aim to fill one page. Just write and let it flow. You’ll get yourself into an appreciative energy and set yourself up to win all day long. As you begin to play the appreciation game, you may notice a radical shift right away. Or it may be more subtle. But you can trust that you are moving into a new energy. Add up those subtle shifts. Consistency is what matters, so make this game a habit! Make it really easy to stay in an energy of appreciation! Sticking to a powerful spiritual practice like the appreciation game is crucial to attracting the life you want. If you want to make it really easy to stay consistent on your spiritual path, the best way is to join my Miracle Membership! The Miracle Membership is a monthly subscription platform and community that gives you lots of resources to help you stick with your practices and attract your desires. Consider joining us here. I know my question is unrelated to the topic of this month, but I really appreciate your reply. Does this count if you receive your sign from universe in a lucid dream? This us just what I needed today. I appreciate it!!!! I love the appreciation journal and the idea of writing it down is a great boon to reminding myself of the awesome things, people and experiences that are already in my life. I like my job and my team, but the commute and cubicle vibes have been really getting to me even though it’s only 3 days a week. I took this week off to recalibrate so this appreciation game is exactly what I needed and oh so timely! Thank you. Thank you for a beautiful post today. I appreciate that I was able to go to London and see you live Friday night. You are awsome! Such an inspiration. So much love. I appreciate you and all that you teach. I too have learned this game from Abraham-Hicks. While playing and feeling appreciation I can instantly feel my emotional and energetic Being begin to expand, raising my vibration almost instantly! It is something I practice on a daily basis. This game or rather to me, way of being, along with meditating daily has increased my ability to align with my Higher Self. 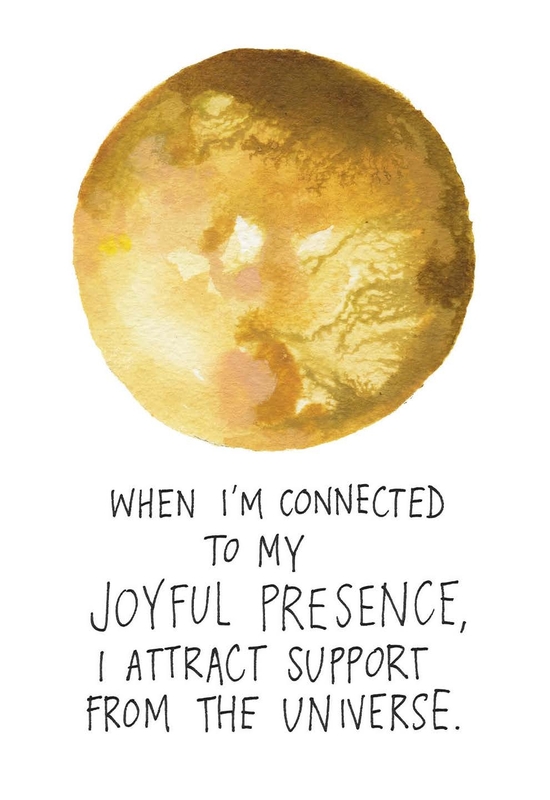 I add to this daily practice drawing one of the beautiful cards from The Universe Has Your Back deck. I appreciate you Gabby! You inspire me as I aspire to uplift and inspire others in their everyday moments. Thank you!!! Love reading this Sherrie! Continue this beautiful work! Great post, with such a powerful yet simple message. Appreciation is free, and we can all join in on the fun. I am currently experiencing an enormous life shift, the ending of a relationship that lasted the majority of my twenties, the loss of a pet, work challenges, and the list goes on! Some days I find myself in a yucky mind-space focusing on lack and my current perceived limitations. These simple tools can really change your state. Thanks for the reminder, Gabby! Hi Gabby! I think the universe make me read this today…I’m actually struggling with finding a job, it has been going for almost 5 months, I’ve been to many interviews but they never called me back and sometimes I really feel frustrated. I’ve visualized, pray, meditate to surrender like you said in your video, give thanks and actually appreciate the things I could do this time and part of me really thinks the universe is trying to show me something with this situation but i don’t know what else I could do to finally find a job. I think I’m blocking some energy or something and I don’t even realize it. Can you give me some advice please? Try this verbiage…you are currently Employable!! Instead of referencing being “unemployed”. Along with what Gabby said about appreciation and small shifts in describing your circumstance (and writing about it) you’ll absolutely see a shift in opportunity!! Hi Diana! I was in the same situation recently and beside manifesting, visualizing, being grateful and all this stuff I also used EFT. You might know this technique, if not, there are awesome videos on Youtube to clear unconscious blocks that can hold you back from getting that new job. These videos help you work on different issues so there is a good chance of finding the right one 🙂 Hope it will help, best of luck! Love this! Thank you for the reminder to appreciate what I have, instead of worring about what I don’t. Just what I needed to hear today! I was praying to see my work situation differently because I am going though a tough time there and it was bringing me down in many ways. Excellent advice! It changed my whole perspective. The Universe does have my back! I just want to say Thankyou Gabby! I want to tell you that the sign game is dope. It was just late night when i was reading the Universe has your back and thought what will be my sign? It was lizard which first came to my mind and in the very morning i went washroom and got my sign. It was such a great start to my day. Hi Justyna. I’m so sorry to hear about the struggle you are experiencing with your son. I am a big believer in working with therapists and counselors. Does the school offer counseling options, or can they refer you to an affordable counseling/therapy program? You may also want to talk with your pediatrician about whether there may be a condition underlying your son’s negative behavior. Your pediatrician may also be able to refer you to a therapist who can work with your son to address what is behind his behavior. I’m holding you in a lot of love and light as you work through this together. I know my current job is not what I like the most, yet I try to learn both at the professional and personal level. People who push my buttons at work are my greatest teachers! And I am actually learning new skills, and traveling a bit. And paying my bills+saving! So it's not that bad 🙂 Yet I know I want to move on. What can I do if I am not clear on what I want? I haven't been clear in two years now……. Love, M.
Yes! My lifetime quote has been from Dr. Michael Beckwith. “Nothing new can come into your life until you are already grateful for what you already have”. Even in my darkest moments, I am grateful that I just have breath. Love you Gabby! Divine timing as always – I was stuck in some negative thinking amd overwhelm. This post reminded me of the path forward – through gratitude and appreciation. This is what I needed right now!!! So deeply grateful! <3 Love, N.
Thank you for this article. It is so good :). However I still wonder – I understand that when appreciating what I have, I attract what I desire. But how do I let the Universe know of my desires while being appreciative of what I already have and of what I do?